Chapter 3 is here and I’m excited to share a bit. Plus I spent some time fooling around and building you a map! Woo Maps! I love maps. Remember to subscribe to the blog and follow me on facebook for more information and more frequent updates! And you can also Pre-Order Iron Tribune digitally through Amazon and Smashwords now as well! (If you click through the links, I get a tiny bit more money from companies). Also check out my Facebook Iron Tribune Release Party! They’ll be a Q&A, plus maybe some giveaways! Sign up today! “Since the murder of the Emperor, we have had two weeks to secure our flanks. The governors of Daciae, Macedonia, Thrace, plus those north and east have pledged their loyalty to you, as the rightful emperor. Dalmatia, Pannonia, and Illyricum have been split. As far as I can tell, the civil war has erupted there in full force. Your greatest supporters in the region seem to be a confederation of cities centered around Narona on the Narenta village. If we can move some forces there, we may be able to take the entire province. 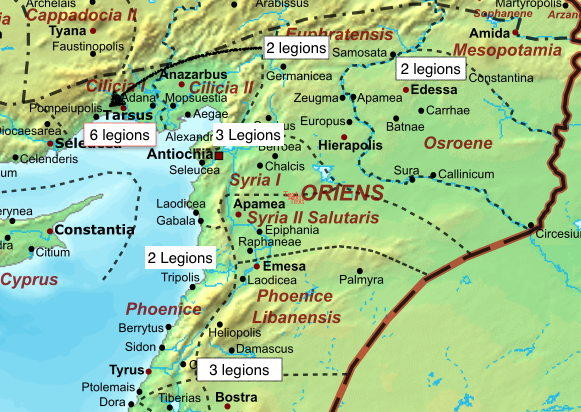 At strength, there are roughly thirty legions in territory that we can definitively claim as our own.” Sovorix spoke as he placed several groups of small flags, bearing the golden Laurel Crown over a field of red, on the map. “So what you’re saying, Speculatores, is that over half my loyal legions are tied down holding back the Mongol invasion.” The primus Caesar had presumed as much, but it felt as though the work of two whole weeks had netted him little strength.